A summary of today’s show: Scot and Fr. Chris talk with Fr. Jack Ahern, pastor of three parishes in Dorchester, one of the poorest neighborhoods in Boston, where he’s already celebrated 20 funerals for murder victims this year. But there’s also much hope in the three parishes with 5 churches, 17 buildings, 6 languages, and a long Catholic history. 1st segment: Scot welcomes back Fr. Chris and asked what he’s up to. They’ve been working to end the seminary year and get the seminarians out to the parishes they will work in this summer. Also, ordinandi are preparing for the ordination on May 21 by going on a 5-day retreat. Cardinal Sean is also looking for the right assignment for the new priests, by getting a sense of the gifts of each man from the seminary by aligning them with the right openings. The men have an hour meeting each with the clergy personnel board. The men will have a dinner the night before and each have an individual meeting with the cardinal that night when their assignment is given. 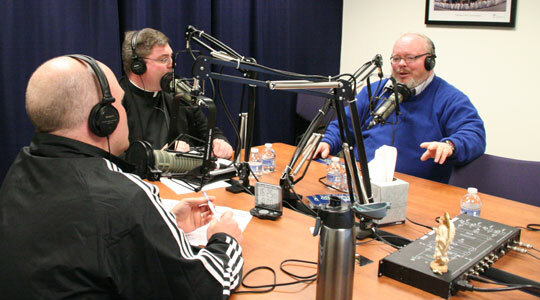 Today’s program is an interesting look at the priesthood in the Archdiocese of Boston with Fr. Jack Ahern who is the first pastor of 3 parishes in Boston. He has had two years working in these parishes. 2nd segment: Scot welcomes Fr. Jack. Recounting his background, his first parish was in St. Albert’s in Weymouth. His last assignment was St. Mary’s in Brookline for 18 years. Now he is in Dorchester with three parishes that were five parishes until recently when two of them merged into the other three. He has been a priest for 31 years. On the day of his ordination, he received a chalice and they said, “All this and more for the priesthood,” and the “and more” was so much more. He has spent a lot of time in Dorchester working on the streets, serving many people who are suffering, including recently celebrating the 20th funeral for a murder victim in his parishes this year. Fr. Chris asked what are the ways Fr. Jack is responding to the violence in the city. He said they often work with the police in the street or go with street teams from the teen center to go into the homes of gangbangers to meet with parents and see how they can help the younger kids into other activities so they don’t get involved in gangs. Fr. Conway at St. Peter’s has been very active as well, learning Portuguese at 71 to work with Cape Verdeans. Fr. Jack moved the parish’s offices from the rectory to the teen center at St. Peter’s so that the kids can see them coming and going and interact. If there’s a funeral, there’s the wake, the Mass, and then a counseling program after for the kids. In the summer, they run a program for the kids because the kids wouldn’t be safe to leave their homes during the day. They are also helping them to become better citizens. At Mother Teresa, they are fortunate to have the Cristo Rey High School move into a vacant school building. The students spent time during the school day working in businesses to give them experience and to help provide support for their tuition. The corporations mentor the students. Scot asked him what it’s like to be pastor in the inner city and dealing with violence, crime, and fear for the safety of their kids. Fr. Jack said it’s exciting to be working there as a priest because every day is different. He knows that he is where God wants him to be. He knows he’s making a difference in the day to day lives of these people and the Catholic Church is the anchor of these neighborhoods. It’s one of the few institutions able to gather people from the other neighborhoods of the city and from other sectors, such as police and politicians. Last summer, there was substantial programming that contributed to a summer without the violence many expected. When kids come to the teen center after school, they have a snack and they spend 2-3 hours doing homework with college student volunteers and staff. Then there are a number of fun activities until between 7:30 and 9pm, depending on age. Fr. Jack said a couple weeks ago when a teen was murdered, several of the kids at the center said they were friends with him and that if they had entered the gangs instead of joining the teen center, they would be dead too. 3rd segment: Fr. Chris asked Fr. Jack what it’s like to be pastor of 3 parishes. In some ways, the parishes are similar with the need for the sacraments, but in some ways they’re different. When he came it was three parishes, five churches, 17 buildings, 6 languages, and a running $500,000 deficit. It’s a challenge. The parishes have a great mix of people who have been in the neighborhood for years, but also newcomers. Many Vietnamese and Polish at Mother Theresa, Cape Verdean at St. Peter, and Spanish at Holy Family. Fr. Nguyen spends much of his time with the Vietnamese community, Fr. Conway with the Cape Verdeans, and a Capuchin who comes in to work with the Spanish. Mass is celebrated in three languages, but Fr. Jack smiles in all six. Scot asked what it’s like to try to bring people together as a single community in the universal Church. Fr. Jack said on Holy Thursday all three parishes came together for one celebration at one of the churches. This year it was in four languages. This year the Cape Verdeans did the music, last year it was the Spanish community. Three priests all live together and are as different as night and day, but they all get together very well and work so well. Scot said the parishes are historic with long stories. St. Peter’s is the second-oldest parish in Dorchester, founded in 1870. The only church founded in the Americas where the stone for the church was quarried from the site. First it was Irish immigrants, then Haitian, then Spanish, then Vietnamese, and now Cape Verdeans. In its heyday, 24,000 people would worship in the church each weekend. The pastor in the 1950s had a chair suitable for use by the Pope built as the presider’s chair and in fact it was used for the papal Mass on Boston Common in 1979. The parishes of Dorchester have been very generous with vocations. At one time, there were three streets where every house had a vocation. St. Margaret’s gave more than 250 women to the Sisters of Charity. Mother Teresa Parish is also the site of one campus of Pope John Paul II Catholic Academy. It was founded from St. Peter’s and was founded as St. Margaret’s Parish. They also have a food pantry on site that feeds many families. Holy Family Parish used to have a shelter, but it was closed due to budget cuts. 4th segment: Scot said the Pope John Paul II Catholic Academy set an ambitious goal to revitalize Catholic education in the inner city, consolidating eight Catholic schools into four campuses. The Columbia campus at Blessed Mother Teresa consolidated the three school of Fr. Jack’s three parishes. He said it was an ambitious goal, but the goal has been met. There’s a commitment to providing a solid Catholic education. While the schools have lost parish identities, they retain the Catholic identity. Fr. Jack said it’s critical for Dorchester to have a Catholic school. It provides a great educational setting for any and all children. Educating all children serves all of society. Fr. Chris said building a more just and humane society serves the mission of the Catholic Church. Scot said Fr. Jack was honored at the Chrism Mass by his fellow priests along with Fr. Jim McCune. Fr. Jack said it was humbling, but he got it he thinks because he was “the only one fool enough to take on three parishes.” the priests of Boston are a great cast of characters who serve the people day in and day out. To those who would say priests are going to be stretched to thin in the future, Fr. Jack would say that you have to be as present as possible while also allowing others who minister with you to be a stabilizing presence. While Fr. Jack moves between the parishes, there is one parochial vicar or pastoral associate dedicated to each parish, available day and night. Sharing other staff like business manager, frees up resources. There are three parish pastoral councils and three finance councils, but they do meet as a group several times a year to take stock of each other’s priorities. Fr. Jack also spoke at the seminary recently. He told them that the most important part of being a priest is to be kind. People come into the church to pray and they have enough burdens so be kind and be welcoming. He learned this lesson from his first pastor who was incredibly kind. He remembers a parishioner being taken to a hospital after an accident, and after visiting the man in the hospital he went back to the home to clean up the blood of the accident so the wife wouldn’t have to. 5th segment: Fr. Jack Ahern has the distinction of being the only Right Reverend among the clergy of the Archdiocese of Boston. He wears a pectoral cross and has a special hat that he can wear that is an Eastern-rite miter. In Brookline, the Melkite-rite Catholic diocese was headquartered at this parish and the Melkite-rite leader requested permission to give him the honorific. He has the title of archimandrite. Scot asked him what are his hopes for the Church in Dorchester? If the Word is preached, if the mysteries are celebrated well, if you’re reaching out to the poor, the Church will grow. St. Mary’s in Brookline attracted many young families and young adults. He said he was very welcoming and he offered strong homilies.